Text and map copyright © 2004 by Chris Evans. To the casual tourist there would be little to suggest that Brynmawr had any railway associations at all. A more knowledgeable observer would notice earthworks running parallel to Warwick Street heading towards Beaufort. This was the site of the London and North Western railway 's MTA (Merthyr, Tredegar & Abergavenny) route to Merthyr. During the mid 18th century there arose in Abergavenny a desire to tap the wealth generated by the great iron works of Merthyr and Dowlias together with the rapidly developing coal trade. Promoted by the industrialist Crawshay Bailey and following the alignment of his tramway from Brynmawr to Govilon an act was obtained on the 1st August 1859. Work was started in Abergavenny on the 18th June 1860, reaching Brynmawr on the 29th September 1862, the Ebbw Vale and Bleanavon branches were completed in 1867 and 1869 and through to Merthyr in 1879. The MTA however had overdrawn its accounts and was leased to and then swallowed up by the giant LNW Railway in 1867. Through these lines the coal fields of Weanavon, Bleanavon, the Sirhowey and Rhymney valleys, Dowlais and Merthyr and Brynmawr itself were tapped, most of the traffic going to the north through Abergavenny. There were still two more railway developments to be made. In 1869 a branch called Baileys Siding was laid from Crawshay Baileys works in Nantyglo, crossing Beaufort Road and joining the MTA near Old Bleanavon Road. This line was later leased by the LNWR and tapped collieries as far as Coalbrookvale. In 1905 after much local pressure a passenger line called locally " The Missing Link" connected Nantyglo station to Brynmawr. 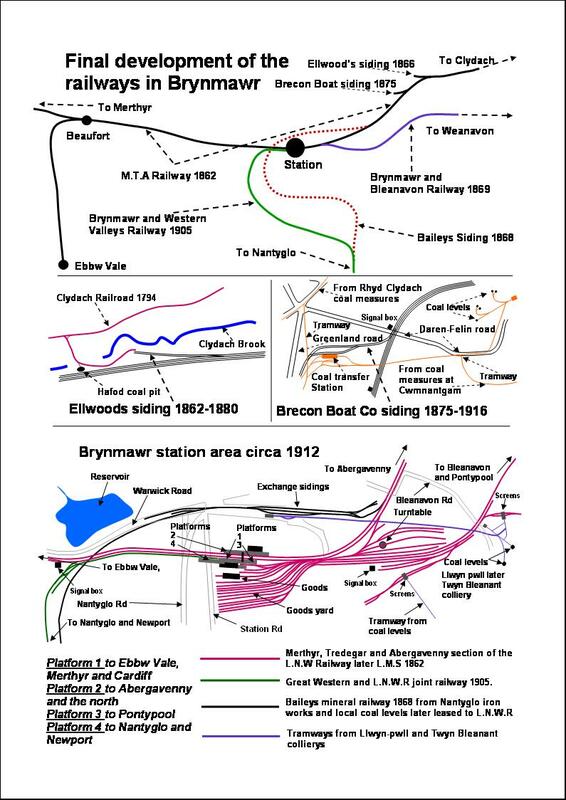 Officially called the Brynmawr and Western Valley railway, this line was owned jointly by the LNWR and the Great Western railway all coal traffic was also diverted to this line, Baileys Siding was then downgraded to wagon storage status but remained in use for many years after. In all six branches contributed coal traffic -The Bleanavon, Sirhowey, Ebbw Vale and Rhymney Branches, Fochriw via Dowlias and the Nantyglo and Blaina line from Rose Heyworth colliery where many trains were so large they required bankers. Coal traffic reached its peak in 1917 when 5000 tons a day were dispatched from the district, much of it going to the Admiralty at Scarpa Flow. The journey from Brynmawr to Abergavenny was slow, coal trains being required to stop and pin down the brakes at Brecon Boat stop board and then release them again at Llanfoist. Of course to balance this traffic there were the returning "empties". Some idea of the passenger receipts can be seen from the following departures circa 1925 allowing for an equal number of arrivals. There were approximately 23 departures daily. The depression of the thirties and the failure of many steel works and collieries saw the gradual decline of freight and passenger services. This combined with the growth of the bus and truck companies meant that the lines became uneconomic and closures became inevitable. Below is a summary of closures. 5th May 1941- Bleanavon line closed to passengers. 23rd June 1954- closed to freight. 2nd April 1951- Ebbw Vale line closed to passengers. 2nd November 1959- closed to freight. 22nd November 1954-all freight withdrawn from the MTA lines. 6th January 1958- Abergavenny to Merthyr through services cease. 30th April 1962- Brynmawr to Nantyglo passenger service withdrawn. 4th September 1963- freight services to Nantyglo withdrawn and final closure. The Brynmawr station site dominated its surroundings. Station street and Nantyglo road passed through arches in the massive retaining wall of dressed stone provided with the Western Valleys line. A mixture of massive black LNWR 0-8-0 locos and little green GWR tank engines were often seen in the extensive goods yard. These are all just memories now, however the route up the Clydach gorge can still be clearly traced and will remain for generations as a tribute to Victorian skill and tenacity. Chris Evans is from Brynmawr but now lives in Australia. On Sundays he and his father would walk the tracks to Llanfoist or the old tramways to Llanelly (the railways were closed on Sunday), and this is what sparked Chris' interest in railways. Page content copyright © 2004 by Chris Evans, with all rights reserved. Website copyright © 2004 Jeffrey L. Thomas.